The frock and the bag are not a set, and the only thing they have in common was that I rushed them off before my 5 day work week routine began. I was a bit frantic trying to ‘finish’ projects before part time work status ended, and I got these two out of the way. The five minute frock was pretty much that! I had found a wallis maxi polyester skirt on the reduced rail (€1) in the charity shop and picked it up with the intent of maybe making another skirt, for the new job. 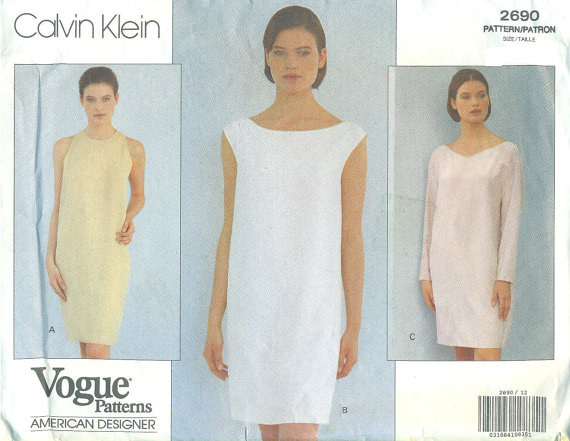 Some days later I wondered if I cut armholes in it would it make a dress? I did and it was. 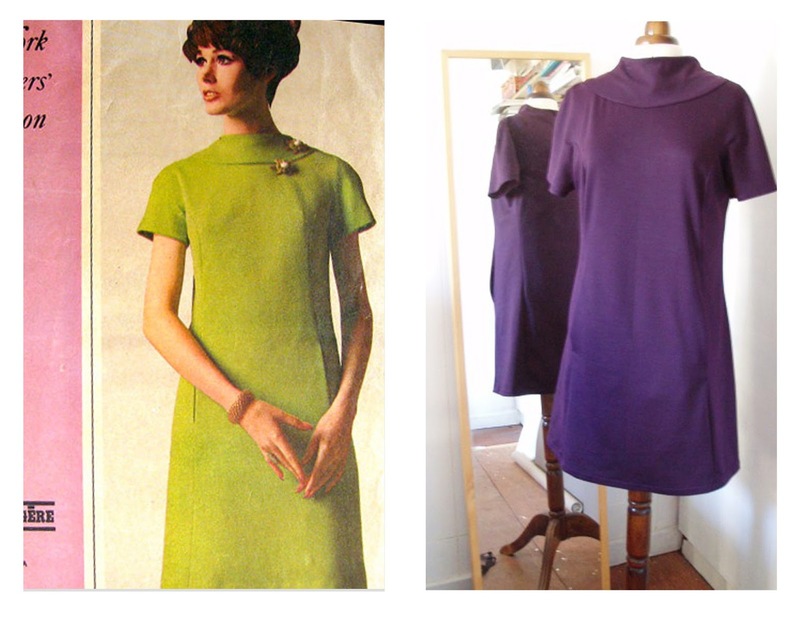 I wore it for the day to see if it was comfortable to wear – it was – so shaped the armhole cuts to curves and hemmed them, and sewed down the elastic waistband which gives a slight structured boat-neck collar. It also can technically be converted back to a maxi skirt later …..should it be needed! The blinged bag was a whim. I had picked the bag up for €3 in a reduced bin. I figure it was reduced as the lining was shredded and the bag, while being a functional black, was also a vinyl bag. I had been rather inspired by Kate’s cross stitching (at our knitty-stitchy group that meet up in Carrolls pub, Dominick St Wednesdays if anyone is in Galway and wants to pop in!) and Lulu Guinness Handbags when I planned this bag. What I had not realised is that Kate makes cross stitch look easy, which it is not. I had trialed a few cross stitch hearts and they were disastrous…..so resorted to a few hours on the embroidery machine and did this one! I used a screwdriver to loosen the bag, and made a new lining. I then embroidered the vinyl, and then got the gutterman glue, put it together again and hoped I did it right. I get a bit frantic towards the end of fixing the bag into the clasp again as i am always convinced it will fall out or I will have missed a bit, but this is the second one ever I have done and both have been fine. The motif I downloaded for free (and edited it to make the single smaller hearts) and when I find the link I used, I will post it here! 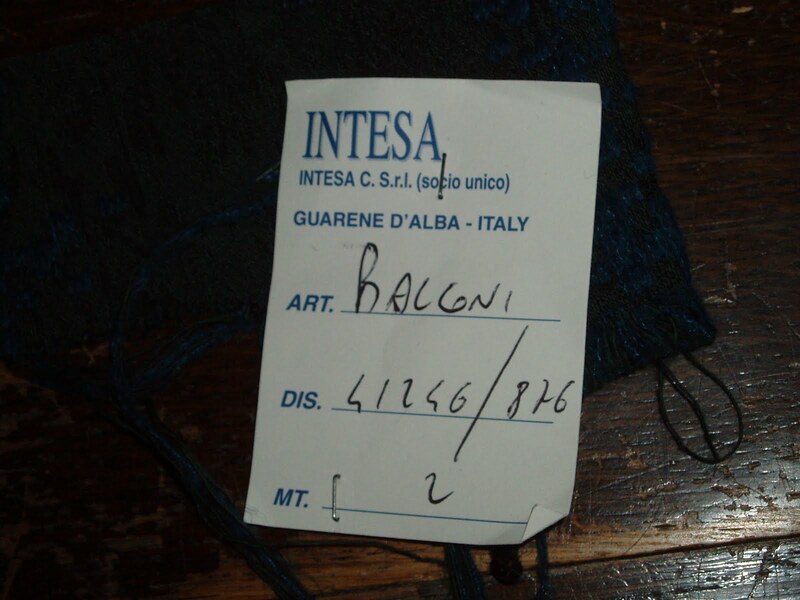 I really have far more than I can re-sew currently, and yet when my friend Petra mentioned she saw a coat in her local charity shop she thought I would like, and I liked the sound of it (wool), and so the next time she was at the shop, it was still there and she got it. One reason it was probably still there, was it’s navy, which does not seem to sell, and yet I find it a better colour for me. It still had its tags, and the maker label – Miller Raynor Danco . I looked them up and it seems they are a brand (still going) that make ship uniforms and this one was from the 70s or 80s as they had some name changes. I could not figure the size but think it an 16 or 18, and it felt a bit big on, and the cut was rather boxy and school-ish. Its a light-weight wool so it really looked like a useful summer/mid-season coat. I left it a few weeks before I cut into it. The main changes I wanted to make were to take out the button thing at the sleeve, and take it in, and I had in mind to add embroidery. I unpicked the seams to the neckline, and tried to work on the coat without fully taking it apart. I used my raglan coat pattern for the front, and trimmed about 4cm off the side seams on the front panels and tapered it the sleeves. When I lay the rest of the pattern on the coat, my pattern was slightly bigger than all the other pieces so I resewed them all up without cutting them. I dithered a bit on the embroidery and settled on a ‘lawn’ motif, and in a single colour. Originally I wanted to embroider the centre front or around the hem. 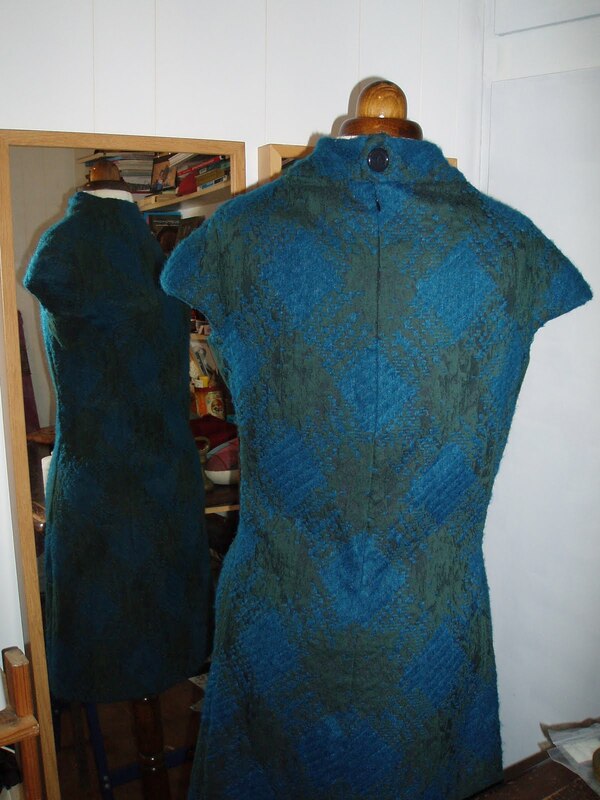 Doing the centre front would have been tricky, and I would need a bigger motif and a machine that could take a bigger hoop for the around the hem, and after a fair bit of deliberation, and dragging another friend over for a consult – the sleeves seemed to be the way to go. It was relatively straight forward, and once done, I decided that the collar had to go. 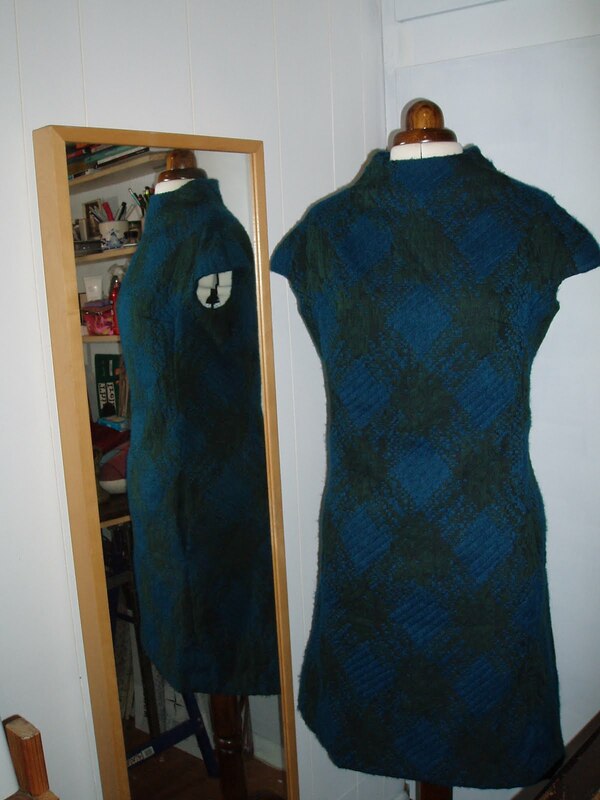 I was going to keep it, but really thought it too severe – so I just tidied up the neck-line until I decided on whether to go for a bound edge on the neck or a ribbing (as in what you would get on a ‘bomber’ jacket). So the plan is to wear it as is, until I figure it out – I still have to change the buttons and I will go for covered buttons in the same fabric and sew up the top buttonhole and replace with decorative button and popper underneath. I packed a DKNY dress (I made this a while ago, and never blogged about it). Its a brilliant pattern and the dress wears well with a base layer or on its own and I have worn it loads since its January make. I tend to wear it with a hand-drawn baselayer. 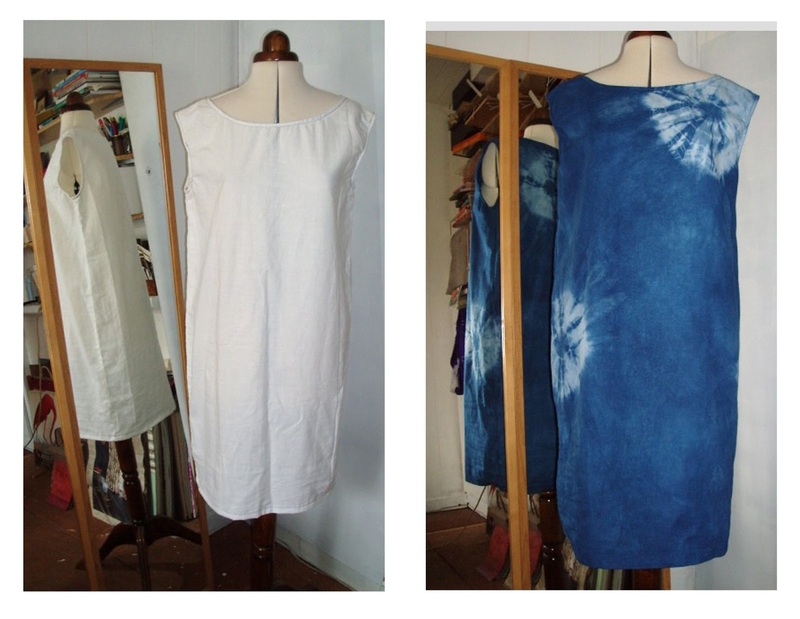 Another make I have never blogged about as I didn’t think much of it as I made it 2 years ago and yet I use it constantly – so much so, that I found white sleeve tee in the charity shop last month and made another! Basically its just drawing strips with permanent marker, and then brushing them with methylated spirits to disperses the pen and then when its dry -wash it well (as the fumes stay in the fabric). The reason I was disappointed originally was that the tee looks particularly cool when its meths soaked and dries rather flat later, but its since become a staple, and now I have 2. In all I was really pleased with my packing as other times I go away, I bring too much of the wrong stuff and dont wear it all – the amount I brought this time was just right and I was able to layer on the two cooler days and wear less on the 2 warm days. The stripe tee looks well with the yellow cardi I upcycled in January, and this works well with my denim cigarette pants, which also work fine with the McCalls summer top from last year, so between that and a few shoe changes I was packed! I used the boots, cigarette pants and long sleeve baselayer and navy sweater for the travel (Navy sweater only item not a MMM) on the Wednesday. Thursday was a beautiful warm day in York – I didn’t not bring my coat at all! -and I changed shoes going to dinner later. Friday was cooler, and I wore the DKNY dress with baselayer and coat for a trip to the Leeds Armoury (swanky photo above) and shops (including seeing the All Saints sewing machine window display – WOW*, as well as the M&S Archive), and on Saturday, wore the cigarette pants, boots, yellow cardi baselayer etc for musuem and gallery visits before heading back. I was well glad of my choice in footwear as we walked loads – the only issue really was the trip was too short and we could only do so much – so thinking of heading over again sometime. So after wearing the coat for the weekend, I am still undecided on collar and will take the coat in a small bit more on sides. Very chuffed with coat – and will be repeating the embroidery on some summer linens. *there was a Tesla car on display opposite the All Saints shop and I never even noticed it- I was only told about it later by my sister who went there on the the Saturday – I was inspecting the machines it didn’t register! I have had these patterns for a while, and a wedding invite last January was a bit of an excuse to make them. It was for an April wedding, (last weekend) in the very west of Ireland (connemara). Both patterns are very simple, and were relatively quick makes (my favourite type). 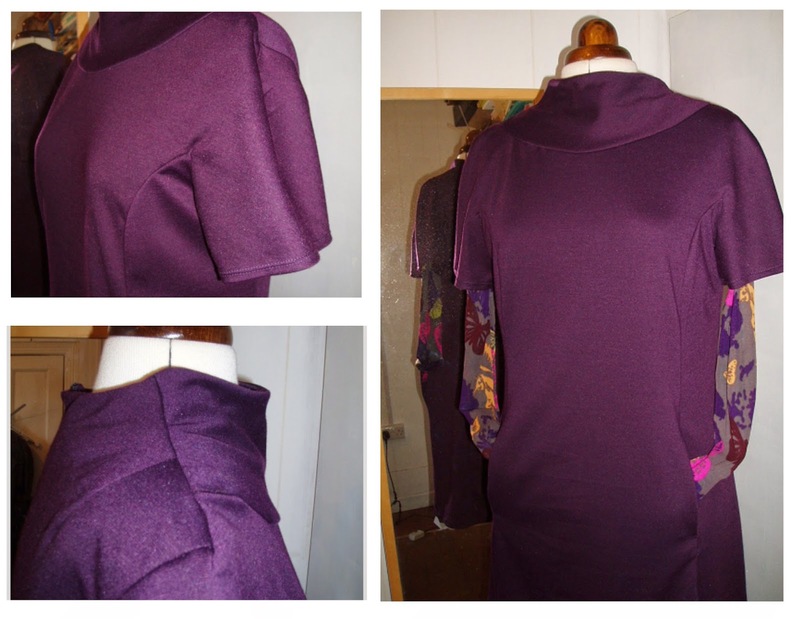 I am especially pleased with the dress as I think the shoulders being slightly extended make it a very flattering cut for the pear shaped, and although I graded it out for my hips, I ended up having to take it in, and for all my ‘A-line empire line shift dress patterns’ this one is the best! I wanted to run up a ‘wearable’ muslin – and as luck would have it, I found a strange (I think 70s synthetic curtain fabric?) piece in the fabric cupboard in the community sew room – It had been there a while, and has a not-great feel to it, but has the look of thick linen, and there was just enough to get the dress out of it. There was not enough for the collar so I used some satin, and I didn’t fully ‘get’ the steaming of the collar first time, so I just bias bound it and simplified it. 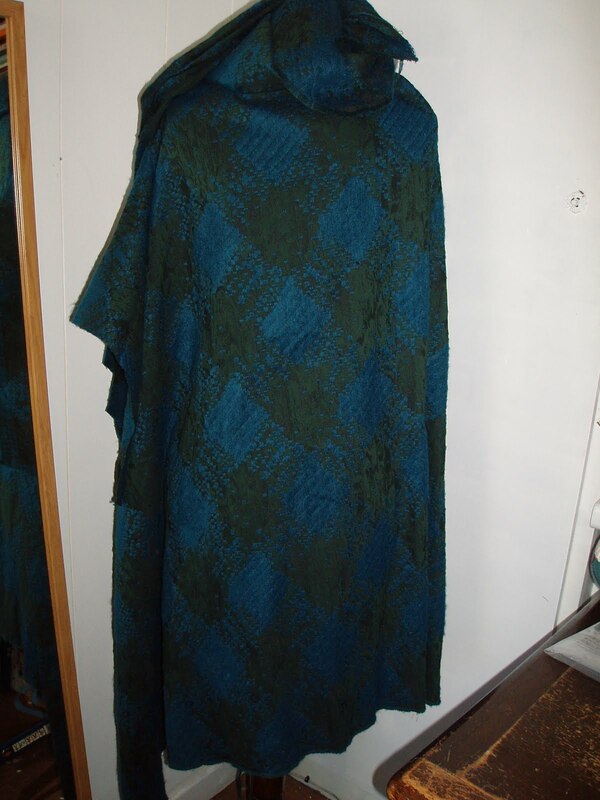 Finding the fabric for both the coat and dress was a bit of a chore as the local fabric shop has only a small selection, and my favourite Dublin shop (Murphy Sheehys) now only does interior fabric, so I went online and got this from Clothspot in the UK. I was trying to keep within a budget (40stg was the total in the end), and chose a grossgrain (not my favourite fabric but knew the weight would work fine) in a red and a cotton in ‘pebble’ for the coat. The red dress was quick to run up and the collar much easier once kept steam ironing – I never did this type of collar before so was pleased with the finish. Basically its a straight strip of bias, folded and then steamed into a curve shape to mimic the interfacing, and then trimmed if longer than the interfacing. I omitted the pockets flaps/mock pockets as I really could not see the point and they seemed unnecessary. The collar of the coat is bias cut, and I had to do a pad stitch – which I never did before and wasn’t sure so out came Allyne Bane sewing book – creative clothing construction (one of my go-to books) and I am really pleased with the roll and sit of the collar, it sits away from the neck. Other than that, the only other issue was BUTTONS (I spent ages and ages and ages on them) – I could not figure one at all, but went with covered ones and they seem fine. I did keyhole buttonholes on the machine, as I had not chosen my buttons until after the coat was fully made. The side seams are slightly to the front on this which makes for comfortable in-seam side pockets, and the ribbon close just threads through under the arms. I think it looks a bit fussy closed, but I do like the way the ribbons drape at the side when its worn open. I stiched red gross-grain over wider plum gross-grain to make the ribbon-tie, and I have a blue brown one which I will use this summer to wear with denims! I made the bag as well, but it was rather rushed as I did it the morning of the wedding! I used a noodlehead pencil case pattern, and then recycled a lanyard clasp. Overall, it all worked so well. The day itself was incredibly sunny, but rather cool, so the coat worked out very well as most of the afternoon was spent on a windy terrace, and I got to wear my favourite silver shoes – so all good. The skirt was in the charity shop, beside a rail of 1euro coats (seriously a whole rail)…. I adored the charcoal shade, and I wasn’t sure what it was, skirt or dress. Its a bias cut, and had a half bubble effect at the front hem (elastic was sewn inside on the front hem), and there was one belt loop at the back – I tried it both ways, as a dress and skirt and it seemed to be both. I had a feeling it was a never-worn-sale-buy, and when I took it apart, sure enough, there was a green sticker that some stores use on the label, and no wear signs at all. The skirt was a zip to the side, and both side seams sat a bit more towards the front, with the right side more so. The back had two long darts, and a belt loop over one. I took some fabric from the belt (nearly half) and folded it over and sewed to make the strap. I got the flattest buttons from the button box and used the super buttonhole maker (but still lined up one button-hole slightly off). I undid the front loop and redid it. Originally I didn’t like how the stitching showed, but after finishing, I also noticed that sewing the loop to the facing didn’t secure it enough, and also the dress sat up at the front, when I put the dress backwards, it sat level at the hem, so I resewed the loop with more even stitches, as at least its was now to the back! The waist darts of the skirt, now acting as chest/bust darts! I am rather chuffed to have a new summer dress as a few of my summer clothes got re-donated as they don’t really go with grey hair (creamy yellows). I am finally getting used to the new hair colour as its now evening out and growing longer, as I love the texture of my own hair (dyed hair has the texture of a fake wig) but as I only really see myself in the mirror twice a day, it still takes getting used to seeing photos of myself! There are a few reasons why I rarely buy fabric, but remake instead…. 2. economics, remaking from charity shop buys is a lot cheaper and has some eco-cred. 4. it seems I lose the run of myself when I get to a ‘good’ fabric store, and buy random crazy stuff, half of which is destined to sit around and taunt me (a certain cream knit with sparkles and a strawberry yogurt number come to mind). I get rather overwhelmed with stash so never ever like having much of it…. I got this plaid in Murphy Sheehys and as I like plaid, wool (its a wool mix), and turquoise, why not…..I was really questioning why I got it when I got home. Murphy Sheehys sells fabric bale ends, so the info on the fabric is often not there (have not a clue what this label meant below) but the choice can be fantastic. I originally wanted enough for a skirt -.75m, as there was just under 2m left on roll – and they and they gave discount for the full piece, so I got it. I was unsure of which looked nicer right side or wrong side, and cross grain (longer diamond) vs on-grain (squat diamond). For the skirt I cut wrong side as it had more pixels and cross grain, and I don’t like it. I made a plain a-line, and it feels neither-here-nor-there, and the pixels side ended up being horrible to match. 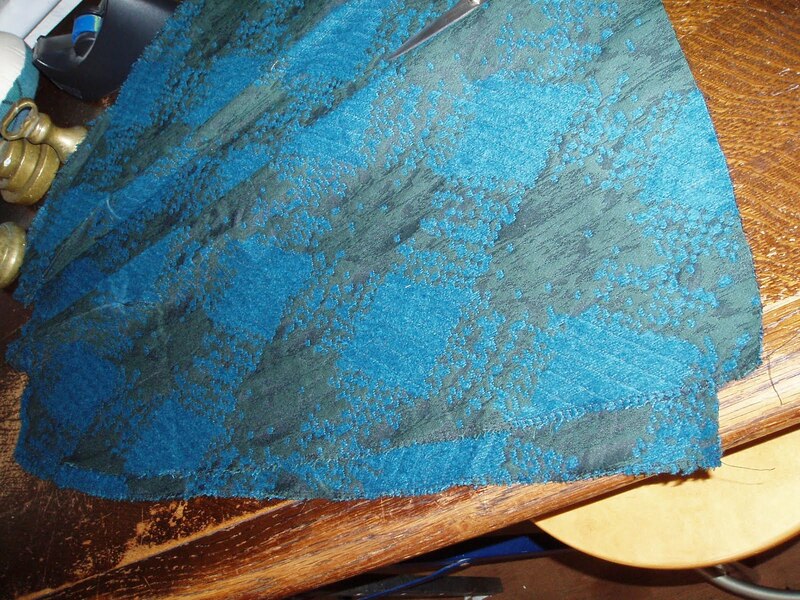 The skirt is finished but not photographed, as even though its in the wardrobe, its only until I figure a remake…. I had just enough to match plaid, and get the dress to knee length…..I cut cross grain again, as I thought the longer diamond looked better. The plaid matched up a dream on sewing and the dress went together easily. I love it, and am currently wearing it with a jade polo neck underneath. 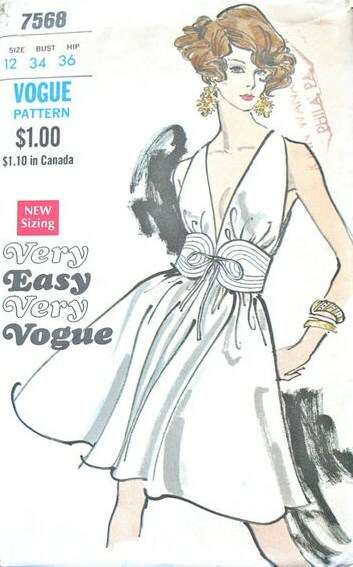 Of all pattern illustrations, these 70s vogues are my favourite. I just love them, so ‘had’ to get this one when I saw it. This dress is incredibly simple – big plus. I made it up from a sheet to try it out, realistically I am unsure I would wear this low a v-neck- can you call it a v-neck? e-bay purchase, the pinking shears…… easy peasy and so fast. I did the shibori effect, but was a bit lazy about the stitching. I originally wanted to dip dye, but this would have been harder to manage and possibly a bit of a disaster, so I am glad I decided against. I did a running tack stitch around the dress. I changed threads every three rows so I was sure to be on the correct row. This was unnecessary but was handy all the same. I gathered each set of three threads from each side and tied and trimmed as I went down through each set (lower set of photos). 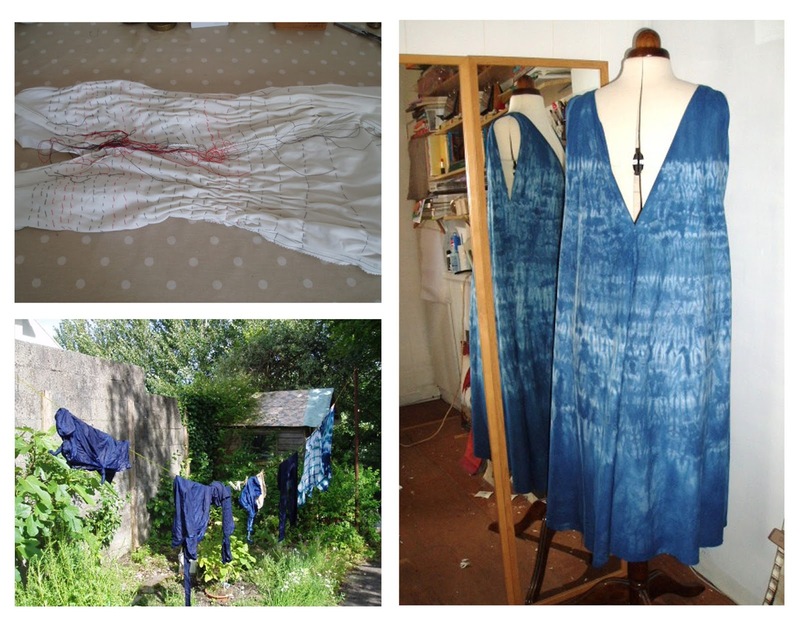 I worked on this dress inside out, so the dress went into the dye vat inside out which gave the right side of the dress a more textured effect which was a bonus. I hand stitched up the front and sides as they are cut so so low, but then undid the front as it seemed to take away from the overall effect! 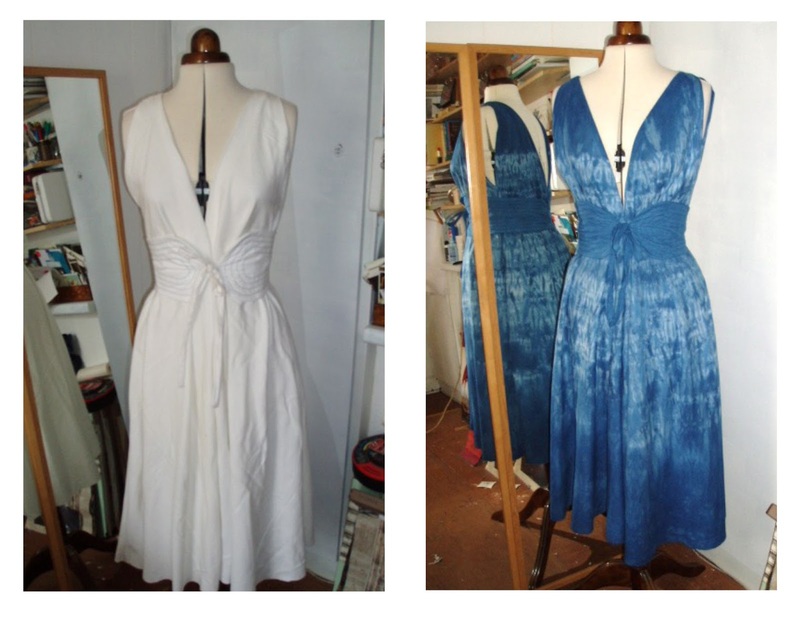 Ultimately, the sheet fabric is too heavy for the dress, However, like the other dresses, once it was dyed, it became infinitely more wearable, but I don’t anticipate wearing the low cut, and am thinking of using the fabric again to make a similar style but buttoned up…….perhaps. However, I won’t decide on this until next year and by which time I will ask my my curvy sister to try the dress on to see what the fit is like on her.. I am unsure as to which way I think the belt looks best……… I think I like the left view best. I am showing 2 friends of mine how to sew. Sewing is a skill I take for granted, and sometimes I don’t even consider it a skill as its just something I have always done – and so, I am often a bit surprised when people profess to not being able to sew (as deep down I still think its innate!). I had to learn to take a step back and slow down on what I am showing them, and concentrate on making sewing samples. 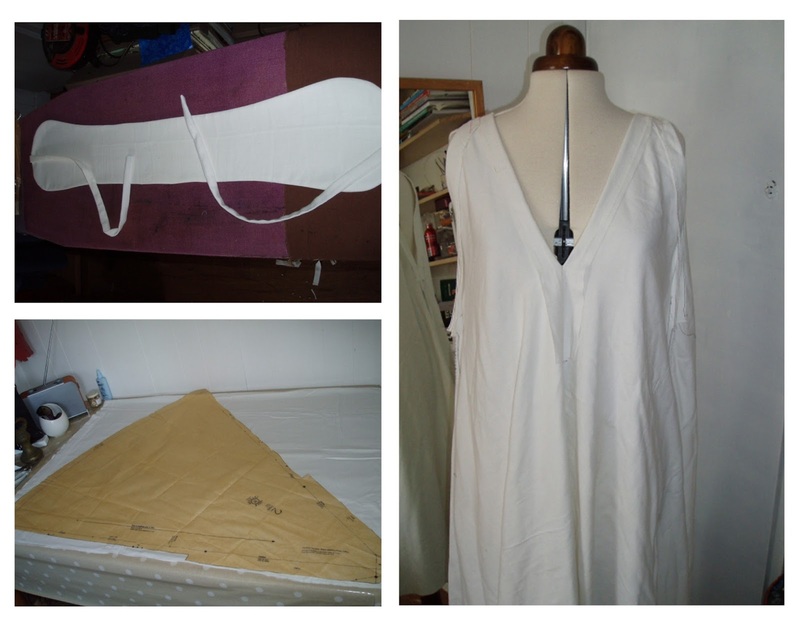 Originally, I had planned that we would start off with making some easy sleeveless tops with a button close, but I was really putting them under pressure, so, I showed them how to sew different seams, and we made some yy bags. 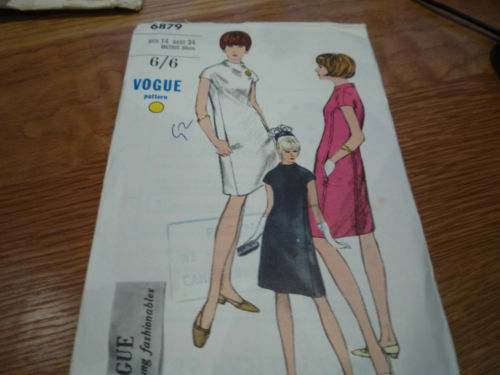 I am hoping that we will try a simple dress soon, so I got this pattern to show them how to work from a commercial pattern and I was hoping also if I whipped one up, they would be inspired to give it a go. 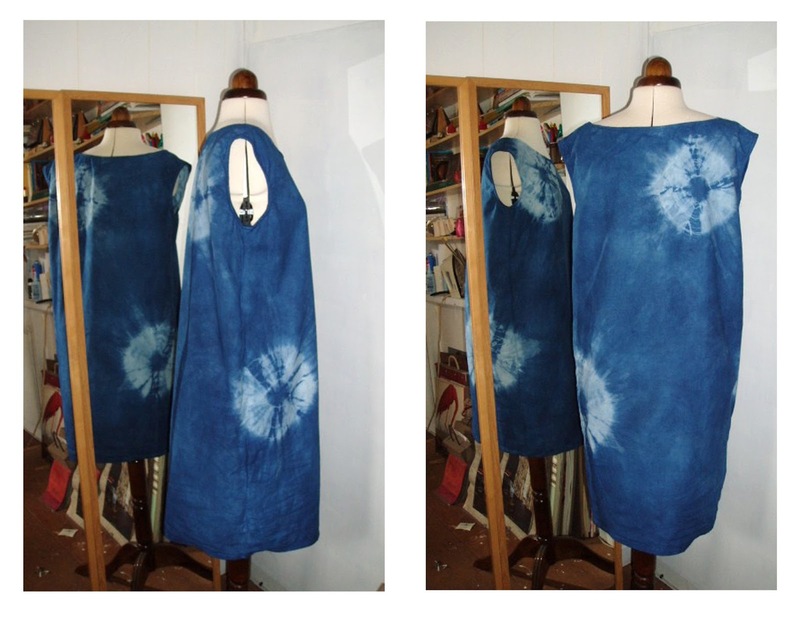 I think this would work as a jumper dress in a heavier fabric, but this one started off as a sheet. Its a handy pattern, no tricky openings and no darts. The main shaping is a subtle boat neckline and slight cap sleeve. The dress curves in a little bit towards the hem. I graded out for my hips. 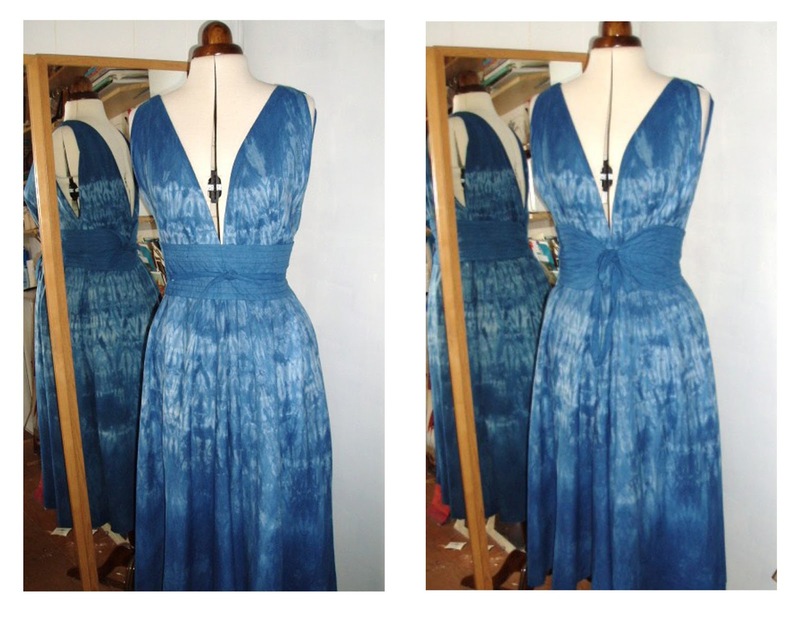 I did a ‘spider web’ shibori effect by winding around some button thread and tying it, and dampened the dress before dying It was pretty quick to do, and very effective in the end!. This was dyed right side out, and the one thing I have noticed about the indigo dying, is the inside out produces a less even effect, which can be more pleasing a more textured look is the aim. (below is a photo of the inside).